Do you want to know how to work with a professional writer? Many small business owners know their business operation intimately and are very good at what they do. However they may not have the skills required to attract and engage new customers… and we all want to attract and engage customers, don’t we? The process of working with a professional writer is unknown territory for some. However, many small businesses are now benefiting from the creative talents of a writing professional. For example, while you may be a fantastic plumber, builder or security expert, you may not be confident in your writing ability. 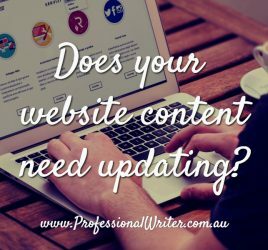 Writing about yourself or your business for a Company Profile or your website copy can be challenging. That’s where a professional writer can help. There are many ways to find a writer, but the most common way is either through a Google search or by referral. Once you have one or more writers who are of interest, check out their website to see what they can offer you. It’s important to have at least a rough idea of what your project entails before you approach a prospective writer. In order to provide an accurate quote, the writer will need to know the size of the project and the outcomes you’re looking for. What experience and qualifications does the professional writer have? Read the writer’s bio or About page to find out their background and experience. Read their testimonials too. IMPORTANTLY – Is English the writer’s FIRST language? 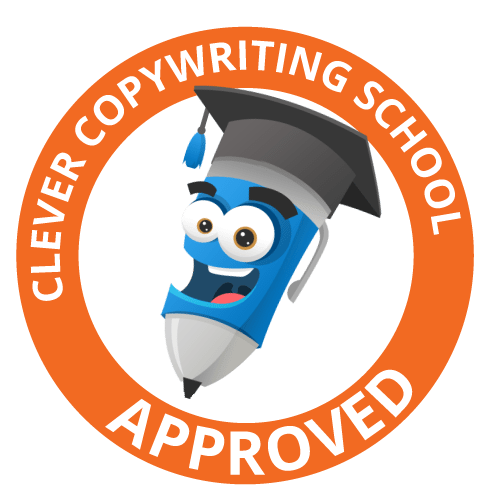 If you want professionally written copy, you need to work with a writer who speaks and writes English exceptionally well, and who has been fully educated in English. Would you outsource your accounting work to someone who wasn’t a well-educated, exceptional accountant? Seek out a writer with experience in the type of project you’re undertaking. If you wish to have a Company Profile professionally written, find a writer who has experience in this area. Is your field specialised? For example, Real Estate is a specialised field where it’s important to have a writer who knows the industry well and who has significant work experience in the property sector. A writer with such experience offers expertise and knowledge that general writers or those who are new to professional writing cannot offer. Choose wisely. So that you can be sure the writer you choose is right for your project, check out their past projects. Most professional writers will either have samples on their website, or ask you to email and request copies of samples. Be cautious about dealing with any writer who is unwilling or unable to supply samples. When you read writing samples, be aware that the tone and structure of the document is often set by the client. Therefore, your project will vary from the samples shown. Samples are simply a good way to see whether you like the writer’s style. Check out the writer’s contact page on their website to find out the best way to get in touch with them. A good professional writer will spend some time with you either in person or on the phone. They will ask questions, take an initial brief and ensure they have a thorough understanding of your needs before providing a quote. In my experience, every project is different. It’s important to truly listen to clients and understand what they’re looking for, rather than take a one-size-fits-all approach. 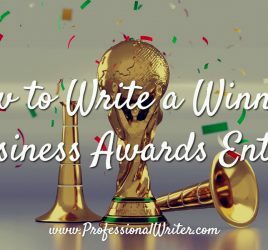 Now you’re ready to work with a professional writer! 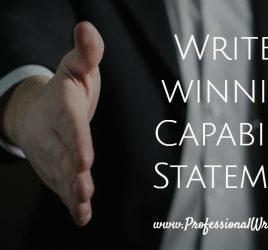 Once you agree on the price, the professional writer will provide an agreement for you to sign and ask you to pay a deposit – usually 50% up front. Once the paperwork is done, the writer will set up a suitable time for an interview. They will ask you to provide as much information as possible about your business, your clients and your processes in order to fully understand what you do and how you work. A lot of questions will be asked, so be prepared to answer them. This gathering of information is a very important part of the writing process. Taking the information you’ve provided, a good professional writer can then write about your business with your customer in mind, in language which appeals directly to your “ideal client”. After all, attracting and connecting with your customers is what it’s all about! That’s why you want to work with a professional writer, isn’t it? The writer will supply you with several drafts – with the number as agreed between you. If you have the brief right and you supply all the relevant information to the writer up front, you should only need 2-3 drafts and then the final copy. Bear in mind that most professional writers are WRITERS, not graphic artists. We write quality content and copy, whereas designers make it look beautiful with the use of colour, logos and design to your specifications. They are two distinctly different jobs. If you have any queries about how to work with a professional writer, feel free to contact me. I’ll be happy to answer your questions. Hi, I’m Lyndall Guinery-Smith, The Professional Writer. I love to write copy dedicated to attracting and engaging your customers, and improving your bottom line. I happily work with clients all around Australia. Email me to arrange an obligation-free discussion about your latest project.